At a special live-streamed event yesterday, information about the new 20th anniversary Sailor Moon anime were revealed, including the release date and schedule, cast, and character designs. 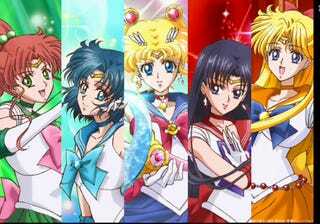 Pretty Guardian Sailor Moon Crystal will premiere on July 5, 2014 and will stream world-wide on niconico on a biweekly basis. Mitsuishi Kotono will reprise her role as Usagi Tsukino/Sailor Moon, but the rest of the cast will be played by all-new actresses. Sailor Moon Crystal will not be a remake of the previous anime or a continuation, but it will be a closer adaptation of the original manga.